This year, for the first time in several years, I started my own plants indoors from seed over the winter. And anyone that knows me knows that I get a little carried away when it comes to tomatoes. I don’t honestly know how many plants Matt actually got into the garden. Somewhere in the neighborhood of 40 to 50? I know, I have a problem. But I’ve reformed, really I have! One year there were over 100. I enjoy trying different heirloom varieties. 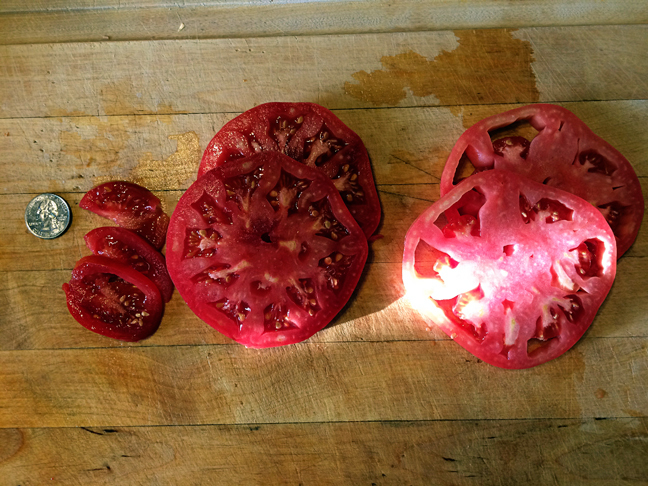 It’s fun to grow tomatoes in interesting shapes and colors, and taste test and compare them. I enjoy reading the histories on them, and you usually can’t find these in stores. Typically I like to choose an early tomato, a good sauce tomato, a slicing tomato, and a grape or cherry tomato. To that end, this year I chose Siberian, Hungarian Heart, Mortgage Lifter, and Sun Sugar Hybrid. Somehow the Sun Sugar starts didn’t make it into the garden. I’m trying not to take it personally. But I thought I’d give a little review of the rest. From the left we have a quarter (ha! ), Siberian, Mortgage Lifter, and Hungarian Heart. The Siberians are supposed to be an early tomato, and I always have visions of enjoying early tomatoes, well, before the rest of the tomatoes are ready. Seems reasonable. 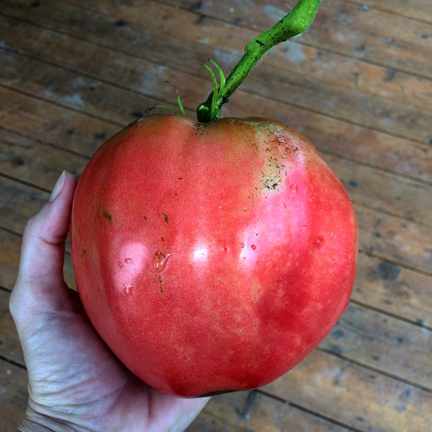 But I’ve never had an early tomato ripen much before any of the rest of them. Still, this was a really easy tomato to grow. They’re larger than a cherry tomato but smaller than a Roma type. Mine were blemish free with beautiful, smooth skins and a deep red color. I ended up oven drying several batches of these. I’ll share that process later. Mortgage Lifter is a variety I’ve grown in the past and always liked. 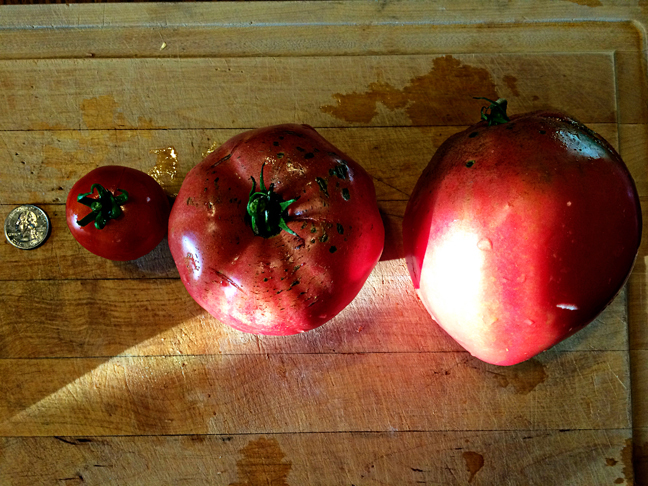 They’re a delicious slicing tomato and can get really large. This year many of mine cracked, but that hasn’t always been the case. I’m chalking it up to weather or something. I also use ML’s when canning tomato sauce. I think they lend excellent flavor to sauce, and if you’re using a Sauce Master (more on that later, too) it doesn’t matter if these have more seeds than the paste type tomatoes. Hungarian Heart is another new variety to me this year. These are adorable – they really are heart-shaped! Very meaty, they’re great for saucing. And because they’re so large, you don’t need many to make a lot of puree. I had some cracking with these, also, but not as much as on the ML’s. The only thing about both the Mortgage Lifter and the Hungarian Heart is that they’re a pink tomato. So sometimes it’s a little hard to tell if they’re ripe or not, because they don’t get that deep, dark red. You can see that the Mortgage Lifters have more seeds and a higher water content than the Hungarian Hearts. I’m not one that loves tomatoes so much that I’ll just eat them for a snack. But the Mortgage Lifter was so good I did just that, plated up a tomato slice (and then another, and then another) with a bit of salt and chowed down. 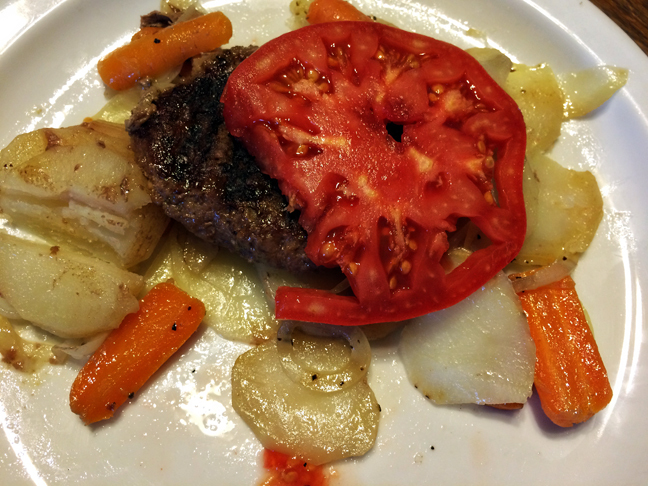 We made “hobo packets” on the grill, and you can see the ML tomato slice was bigger than a quarter pound burger. Yum! I’m not sure what I’ll do next year. I really liked each of these tomatoes. But the fun of trying new-to-me varieties is just so alluring! 1. What are your favorite tomato varieties? 2. How do you keep yours staked so that you don’t end up with the massive tomato jungle that I’ve got in my garden?